Chris Kilham the Medicine Hunter - ARTE AMAZONIA provides a global voice through art for the indigenous cultures of the Amazon. 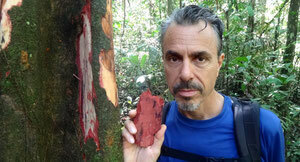 Chris Kilham is a medicine hunter, author and educator. The founder of Medicine Hunter Inc., Chris has conducted medicinal research in over 30 countries. Chris is The FOX News Medicine Hunter and appears on FOX News Health TV both online and in US and international television markets. He also writes a weekly FOX News Health Column and is on the Medical Advisory Board of The Dr. Oz Show. As Explorer in Residence for Naturex of Avignon, France, Chris conducts medicinal plant research for the largest botanical extraction company in the world. He is also an advisory board member of the Naturex Foundation, which funds community development projects in various countries. Chris works with companies to develop and popularize traditional plant-based food and medicinal products into market successes. These include kava, maca, rhodiola, schisandra, horny goat weed, catuaba, tamanu oil, herbal beverages and dozens of other plants. He is currently building market demand for cat’s claw and dragon’s blood, both medicinal plants from the Amazon rainforest. Chris is the author of fourteen books, including Hot Plants, The Five Tibetans, Psyche Delicacies, Tales from the Medicine Trail and Kava, Medicine Hunting in Paradise. Chris also writes articles on plant medicines for several publications, and is a contributing columnist for FOX News Health. Richard Branson features Chris in his new book, Screw Business as Usual. Chris lectures extensively on holistic health and botanical medicines, throughout the United States and the European Union, Hong Kong, Thailand, Dubai, Australia, Peru, Vanuatu and many other countries. Recent appearances include The LOHAS Forum, 10th International Herb Symposium, Vitamin Shoppe, GNC, In Cosmetics, American Herbalists Guild, Missouri Botanical Garden, Atlanta Botanical Garden, Medicines of the Earth Symposium, Natural Products EXPO East, Natural Products EXPO West, Southwest Yoga, Midwest Yoga, Plant Teacher's Convergence, University of Massachusetts, Evolver, Geneva Vitafoods Conference and HBA New York.